Massachusetts Republican Candidate for Governor Charlie Baker said he would be comfortable with a bill that would raise the state’s minimum wage from $8 an hour to $10.50 an hour by the middle of 2016. 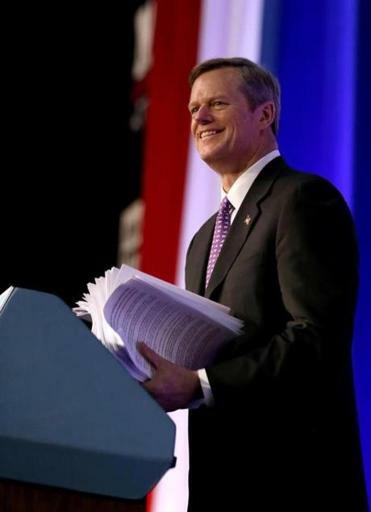 Republican gubernatorial hopeful Charlie Baker said today he was “comfortable” with legislation that would raise the state’s minimum wage from $8 to $10.50 an hour by the middle of 2016, staking out a new position on a hot-button issue in Massachusetts. The state Senate and House of Representatives have both passed separate bills incrementally raising the minimum wage. The Senate plan would raise the minimum wage to $11 by the middle of 2016 and tie further increases to inflation. The House plan would boost the wage floor to $10.50 over the same time period and would not tie subsequent increases to inflation. The chambers have not yet agreed to a way forward on the issue. “I’m comfortable with the House version, but I really want it attached to small business tax credits,” Baker said in an interview after visiting a Boston nonprofit. Asked whether his comfort with the House plan meant he supported it, Baker did not directly answer. “I want to see a small business tax credit and I want to see an earned income tax credit and I don’t see either of those yet,” he said. But, the candidate added, the Legislature had a weeks to go before they recessed this summer. Baker, a former health insurance company executive and state budget chief, said he did not support indexing the minimum wage to inflation, which would mean it would rise with the cost of goods and services. “Times change, things change, I don’t think anything should be presumed to be permanent, with respect to stuff like that,” Baker said. Raising the minimum wage has been a touchstone issue for Democrats both in Massachusetts and nationally. President Obama has encouraged a federal minimum wage boost while also pressing states to increase how much their worst-paid workers make. All five Democrats in the race to succeed Governor Deval Patrick have said they support raising the minimum wage. Baker had earlier said he was open to increasing it. The two chambers of the Legislature remain at odds on the issue and it is unclear when — or if — they will hammer out compromise legislation. Meanwhile, a potential 2014 ballot initiative raising the minimum wage is also pending.